Government experts are investigating a fantastic noise which, from time to time, strikes Tatany Heights School. 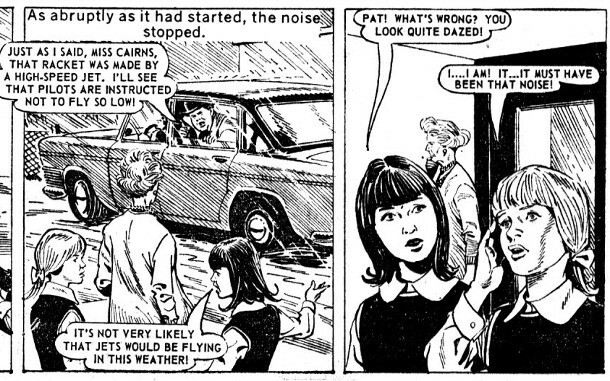 One of the experts, Mr Tenby, claims that the noise is caused by low-flying jet planes, but his companion, Mr Mountjoy, goes to investigate the downs near the school, where Pat Sims and Anne Dennis have seen weirdly-dressed figures. When Pat and Anne go to warn Mr Mountjoy that Mr Tenby is impatient to leave, he vanishes before their eyes.